The author's drawing of her heart utilizing the technique of defamiliarization. Incorporating defamiliarization into practice builds empathy and broadens our worldview. It challenges us to expand and find confluence between different frameworks through which an experience, such as a disease, can be interpreted. 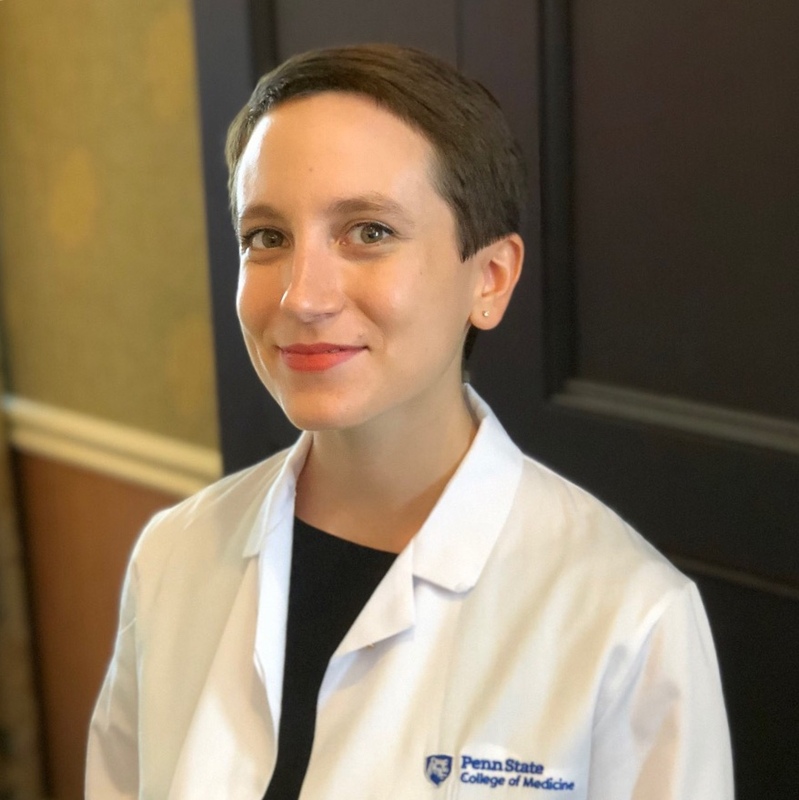 In July, I started my first year of medical school with Penn State College of Medicine’s new University Park Curriculum. Each week my classmates and I develop learning objectives based on patients we have seen in clinic. The ability to engage in small-group discussion and self-directed learning are key reasons why I chose this curriculum. This particular day’s focus was on a patient who had come into clinic to discuss her congenital heart defect. 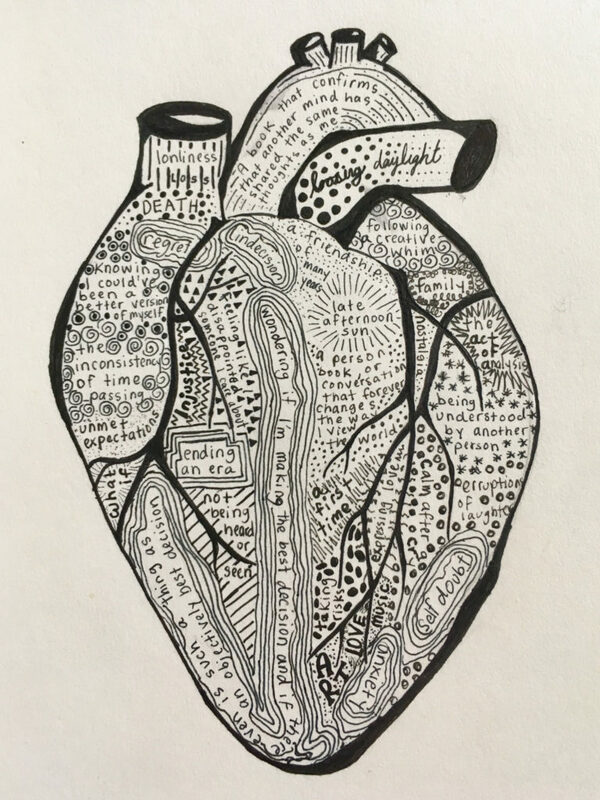 A key tenant of my group’s investigation of this case was challenging ourselves to create an artistic representation of the heart considering the technique of defamiliarization. Defamiliarization, a term coined by the Russian formalist Victor Shklovsky in 1917, refers to a literary and artistic device whereby the representation of a common object or idea in an unfamiliar way brings about a new understanding of it. I have always enjoyed the process of representing something visually, and my first inclination was to create a model, either through drawing or sculpture, of the heart’s valves, chambers, and vasculature. This would not always have been my first instinct, but studying the anatomy, physiology, and various pathologies of the heart, and growing my identity as a physician, reshaped my view of the heart. Over the past seven months, conceptualizing this organ as a functional pump became my new familiar. Most patients, however, will not posses a medicalized understanding of the heart, and will instead resonate with its deep symbolic value. To synthesize the functional-symbolic dichotomy of the heart, I chose to “map” my range of emotional experiences onto the anatomical geography that reflects its meaning. For example, I mapped repetitious and looping thoughts and feelings along the heart’s conduction system because of their shared autorhythmicity. Incorporating defamiliarization into medical pedagogy and practice builds empathy and broadens our worldview. It challenges us to expand and find confluence between different frameworks through which an experience, such as a disease, can be interpreted. As a learner early in my identity formation, this is an important foundation for which my work as a physician will build upon. Defamiliarization, however, is a lifelong practice that I will enact throughout my career. It gives rise to evolving reflection and discovery, and disrupts automatic thought processes and assumptions that can give rise to apathy, detachment, and bias. 1.) Explore diverse representations of illness and the human condition through modalities such as literature, poetry, film, performance art, music, and visual art. Consider why your reaction to a work is what it is. 3.) Challenge yourself to represent medical knowledge in a different way. For example, write a poem from the vantage point of someone having a migraine, or write a short children’s play using puppets about what it is like having juvenile diabetes. 4.) Change up your routine. For example, periodically conduct a home-visit to observe a patient in his or her own environment. 5.) Whenever possible, ask yourself why a patient is motivated to behave in a particular way, and why your assumption about a patient is what it is. For example, question why a patient may not be taking his or her medication. The author’s drawing of her heart utilizing the technique of defamiliarization.